I should have my head examined. I knew I really didn't have time for this. Yet wanting to make a child's face light up often makes you take on foolish projects. When we saw Dillon and Nai Nai for a family wedding in April, I took along a quilt my grandmother had made for me to give to Dillon. I'd been meaning to send it to him. The entire front is one huge LeMoyne Star in red, white and denim blue. I have no idea what my grandmother was thinking. I know she meant well in wanting to get me a beautiful quilt. The quilter did a great job but I would have much rather had a scrap quilt my grandmother made herself. I've never used her gift; I didn't have any children and Lenny had daughters. This always seemed like a boy's quilt. Plus, Dillon's favorite color is red and the background of the quilt is bright red. I thought he could put it on his bed, I knew it would match his room. I certainly didn't think it would be a big deal for a little boy. He loved it! He slept under the quilt at the hotel and made a big fuss over how much he liked it. Nai Nai didn't seem jealous at all that Dillon got a gift and she didn't. But I felt bad. They are too young to understand that I was just passing along something I didn't use. So when we see them this summer, I wanted to have a quilt for Nai Nai. And now the foolish moment arrives. I decided a few weeks ago to make her one! Now I know I don't have time to make a full size quilt. I'm making a 60" x 80" in colors she will like - bright pink and purple. Since I'm making it myself, I hope this balances out with Dillon's queen size quilt. The key is that I have to get it done! The pattern is extremely simple. 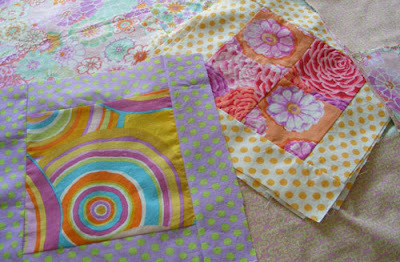 I'm doing some squares within squares and some four patch. Some of the blocks are just going to be solid - no piecing. My only challenge is that I have to hand cut everything. The rotary cutter kills my hand so it is measure and cut every piece. Even large pieces are time consuming particularly with my other work. Still I'm commited. I made an 'investment' in mail order fabrics plus I have a sweet little face to light up. Stay tuned. Hopefully in a couple of weeks, you'll see a photo of a finished quilt. Lisa, have fun with the quilt. I love them but have not patience piecing them. I don't mind the stitching. But I'll leave the quilting to my sister...who still has not finished my son's baby quilt and he's 20! I just spent some time going through your cards - love them. You are very talented. Looking forward to following your blog!